YESTERDAY'S TOWNS: QUASSAR'S QUIZ: NAME THIS ACT???? This Mystery Act photo comes from Bertha Nonnenmacher Campisi, it is R.B.B.B. 1950'S. I know this will be easy for john h. but how many of this bunch can the rest of you identify, & what was the act. Why don't they do acts like this anymore, I thought it was quite entertaining. Something to do with EDDIE Z? Off subject: That was a wonderful thing you did for STRUPPI H. The best Trapeze performer in the world to me. I would love to have those tapes also. She is one of a kind. One of those acts that I stoped what ever I was doing to watch her. It appears to be a house thing that Concello put together where they did comedy diving into the net. It went over big just like comedy aerial bars. Fay said it was a fun thing and they could improvise. Concello had it on the Orrin Davenport dates. They dressed like gay nineties beaqch goers. I don't recall any name for it. All the flyers participated. Generally useful contracts. I mentioned to Bill on sat. night at the club that I felt I had won in the identity contest by picking Glenn Henry and asked Bill what the prize would be. He replied, a free ticket. I am hoping it will be a ticket for what is rumoured to be, an idea from the Mayor and Chamber of Commerce, of astretch limo tour with a tour guide pointing out the homes of the famous showbusiness personalities residing in the area and places of interest in Gibtown. Just like Hollywood. I could even luck out by catching Gaylord at one of his frquent visits to the Great Huston. Just like Beverly Hills. Oh well you can't win em all. You guessed the prize too, the only problem is there is not enough in the Chamber of Commerce budget for a limo. The tour will be conducted on the back of His Honor The Mayor's Canary Yellow Motorcycle, driven by tour guide Ward Hall!!!! Isn't the blond Jeanne Sleeter? Penny, I think you are correct on Jeanne....I would like to know the last three that haven't been I.D. Help out someone. Penny anymore info on Vince Carmen's return to Classic Car Museum for the Sarasota Winter Season.. Since no one else has come up with it, john h. was right about it being the Diving Act. 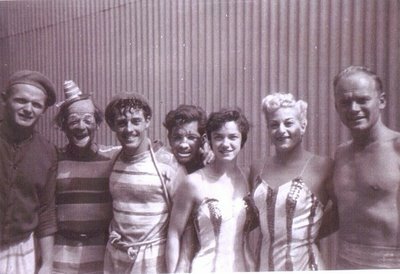 L to R as they were described to me, Bobby Yerkes, unidentified clown, Fay Alexander, Johnny North, Gloria Bischof,(wife of Horst Bischof(Bokara), Jeanne Sleeter. The guy on the right I recognize but I always have a mental block when it comes to his name. He looks like Walter Long. David, No news at this time on Vince. Sorry. Will let you know when I hear anything. In discussing this act with john h. he thought the clown between Bobby & Fay, might be Bones Brown.